In the beginning change is hard. We think that one of the reasons that we are successful helping people who have not had good response to treatment elsewhere is that we focus a lot of attention on the early phases of treatment. Sometimes we recommend beginning with more than weekly visits to try to “break through” those processes (internal and external) that tend to resist change. 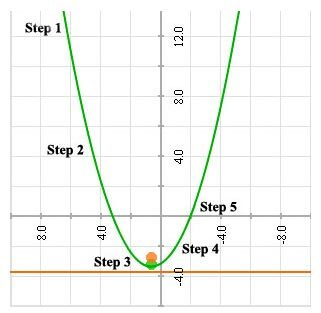 One of the metaphors for the process of change that we find helpful at times is the metaphor of the parabola. Step 1: We are in free fall, our lives are getting worse rapidly. Step2: We have managed to slow the process so that things are not getting worse quite as fast, but this has taken a lot of effort. Step 3: It seems we have gotten nowhere, but actually through great effort we have stopped things from disintegrating. Step 4: We have begun the process of recovery and are moving in the right direction, but still there is hardly any reward for our efforts. Step 5: For most of us this is the first time we get any reward as we notice the progress we are making, but look at all the effort we have put into the change already.